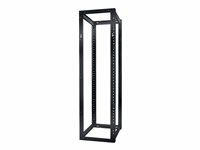 The NetShelter 2 Post Open Frame Rack offers a quality solution for the economical installation of rack-mountable networking equipment. The 2 Post Rack offers cost conscious customers a simple solution for rack mounting network equipment in a secure managed environment including datacenters, wiring closets and co-location facilities. 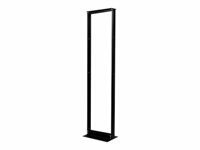 Each NetShelter 2 Post Rack is made with high-grade aluminum extrusions and offers a generous 45U (78.75" or 200 cm) of equipment mounting space in a 7-foot high design. The self-squaring design makes assembly quick and easy and requires only one person to fully assemble each unit. 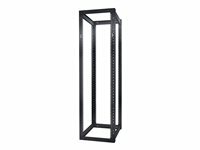 NetShelter 2 Post Racks are designed to accommodate most rack-mountable devices that fit within a standard 19" rack using 2 posts. Alternating hole patterns in front and rear of each channel provide for easy installation of equipment. Six web channel holes per side allow for multiple racks to be configured side by side. To complete your installation, choose from many NetShelter Rack Accessories to simplify installation of your network management peripherals and/or cabling configurations. Cable access openings and panels Large cable access slots in the roof provide access for overhead cable egress. The bottom design allows for unobstructed cable access through a raised floor. Perforated front and rear doors Perforated front and rear doors provide ample ventilation for rack-mount equipment. Quick release doors with spring pin design Front door can be moved to the opposite side or interchanged with rear doors. Doors are easily removed with simple spring hinge pin design. Removable full-height side panels Side panels are removable for ease of access to the enclosure during equipment installation and setup. Side panels are lockable utilizing a single key that is also usable on the front and rear doors. Adjustable mounting rails with simple alignment The vertical mounting rails can be adjusted in 0.4-inch (10 mm) increments covering virtually any mounting requirement for IT equipment. Align the mounting rails with the opposite side of the enclosure by identifying the hole position used. U positions are numbered front and back for rapid installation of equipment. Split rear doors Split rear doors improve access and serviceability to rear of rack mounted equipment. The split rear doors help to maximize floor space. Standard-profile castors and adjustable leveling feet from underneath Enclosures are shipped standard with both leveling feet and castors. Leveling feet can be adjusted using a wrench from underneath the enclosure. Integrated electrical grounding The roof, side panels and front and rear doors are grounded to the frame of the enclosure. Eight additional electrical grounding inserts are located on the frame for external grounding.